Elizabeth wrote about preexisting conditions for The Washington Post, here. A beautiful review of The Tincture of Time from the Jewish Book Council, when it was selected as their Book of the Week. 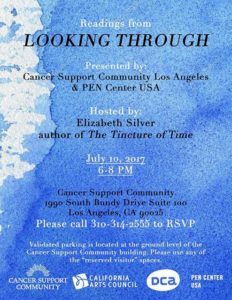 Elizabeth partnered with PEN Center USA for a four-week writing residency at Cancer Support Community Los Angeles, teaching creative writing to those coping with difficult diagnoses. The residency culminated in LOOKING THROUGH, a beautiful anthology of writing and a Public Reading of its contents.